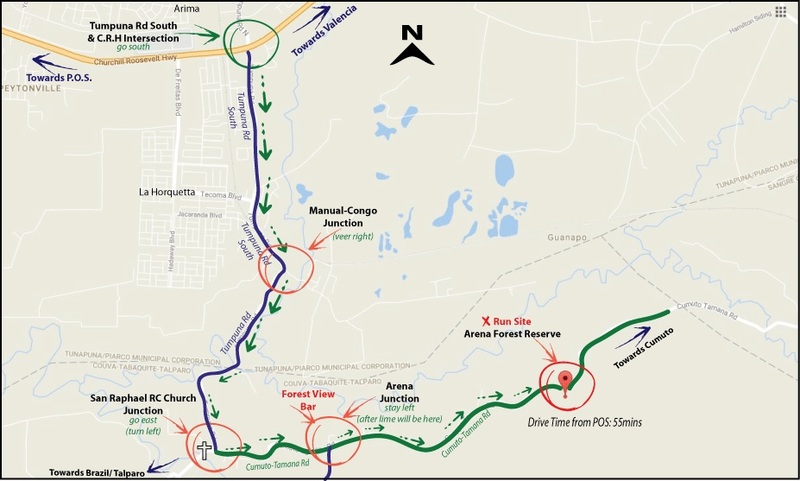 Directions: Proceed East along Beetham Highway/Churchill Roosevely Highway towards Arima. Take exit at Tumpuna Road & Churchill Roosevelt Hghwy (intersection directly after O’Meara). Proceed along Tumpuna Rd South for 2km until Manuel Congo Junction. Continue (veer right) along Tumpuna RT South for further 2km until San Raphael Junction (San dRaphael RC Church). Turn East (right) along Cumuto-Tamana Rd towards San Raphael/Cumuto for 1km until reach Arena Junction. Veer left and continue along Cumuto-Tamana Rd for 2.4km until Arena Forest Reserve Rest Site. Parking: Park as directed on area opposite Rest Site (open area on North side Cumuto-Tamana Rd). No driving/parking on trail rides. There will be Chicken/Saltfish/Veg meals in LIMITED quantity $35.00/meal. Please place bookings WA Only 279-4788, 305-1053. A limited Hash Bar will be on-site. Once sold out we will move on to the “On-On-On”. Support your Hash Bar! Over time most of our pristine nature reserves have been laid waste to illegal dumping, littering and general neglect by our citizenry. You will be witness to this in several areas of the run. Let us set ourselves apart..as the exception rather than the norm! We ask you walk with a small garbage bag and pick up whatever garbage you may come across, either on parts of the run or in your immediate recreational area. Garbage Segregation Protocol would be in place for this run [again something that the hash leadership seems to have dropped on the wayside]. Limit your non-recyclable waste. Directions: From POS proceed East via the Churchill Roosevelt Highway passing Nestle, FEDEX and Pricesmart all the way up to Valencia Junction. On approaching Valencia Junction you will see the Police post on the right, the road then splits. Stay left and proceed in the direction of the Toco Main Road. Drive for about 10K, approx. 25 to 30 mins. you will approach the Toco Main Road turnoff, turn left onto the Toco Main Road. From there you will pass Matura, Balandra, Cumana villages on the way to Toco. There will be FOOD on sale. Leave home with enough time! The drive usually takes about 2 hrs from POS. We advise the earlier the better!! !